Join Sports Leisure Vacations on Holland America’s ms Zuiderdam, a signature midsized Vista-Class ship (1,900 passengers) featuring modern amenities and spectacular art and antique collections. Capital cities of Northern Europe: Copenhagen, Tallinn, St. Petersburg, Helsinki, Stockholm, and Berlin. Departing Copenhagen, step back into time with Tallinn’s medieval spires, and take your time enjoying the fabulous art at the Hermitage with an overnight in St. Petersburg. 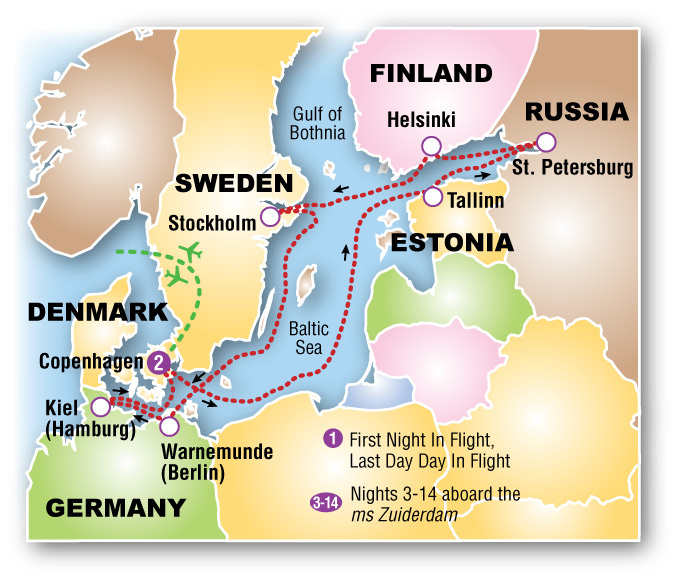 Visit the capital cities of Helsinki and Stockholm; and in Germany, see the sights of Berlin and Hamburg. Copenhagen is one of the easiest European capitals to fall in love with… cobbled streets and the tower-and turret-dotted skyline lend a fairy-tale charm… this was after all, the home of author Hans Christian Andersen. Denmark’s Arhus is a picturesque town of winding canals located on the east coast of the Jutland Peninsula. Recognized as a European Capital of Culture, the city hosts a collection of waterside developments that are architecturally innovative while anchored to the simple and pleasing Danish aesthetic… creating a relaxing place to enjoy the Danish sea air. Tallinn, Estonia is Northern Europe’s oldest capital. It is also one of the best preserved. St. Petersburg, Russia emerged from the vision of one man, Czar Peter the Great, at the beginning of the 18th century and was the country’s capital for 200 years. Pushkin called it Russia’s “Window to Europe.” The Hermitage is the most famous attraction – one of the world’s greatest art museums. Nearby, the summer residences of the czars, are dazzling gilded Baroque palaces. Finland’s capital, Helsinki, has its own singular style and appeal. Modern architecture captures the sun reflecting off the water for a truly brilliant picture experience on the coast. The Swedish capital of Stockholm is spread over more than a dozen islands linked by bridges. Enjoy the verdant Djurgarden with museums and cultural sites; or the Gamla Stan area, home to the Royal Palace. Berlin, one of the younger capitals of the North, has had an incredible history as the epitome of excesses during the Weimar Republic; and then the capital of the Nazi Regime. For 45 years, it was divided by the infamous wall. Today, Berlin is once again unified and visitors find an intriguing, vibrant city filled with cultural treasures. Thoughtful memorials and museums acknowledge the darker moments of history, while the artists and entrepreneurs enthusiastically embrace the futuristic atmosphere of possibilities. Just 90-kilometers from the seaside port of Kiel, Hamburg is Germany’s “Gateway to the World.” Located on the mighty River Elbe, this commercial port city is filled with an air of maritime mystique and excitement. Gold Passport Points based on cabin category. Australia, Tasmania & New Zealand aboard the ms Noordam. Includes 3 night pre-cruise land package in Sydney. Place your name on the Priority Notification List now! Great lakes, majestic mountains and so much more! The Gulf of St. Lawrence and iconic eastern seaboard villages. Join Sports Leisure Vacations on Holland America’s ms Veendam, a signature ship (1,350 passengers) recently enhanced and grandly proportioned; combining modern amenities, and elegant spaces graced by spectacular art.